Important notes: In flex spot one, we can play a running back or a wide receiver. In the superflex spot, we can use any player in the pool. If you’re looking for tight ends, they are all listed at wide receiver. Florida State just surrendered 475 passing yards to Samford last week. No, that’s not a typo and I didn’t mean Stanford. SAMFORD. 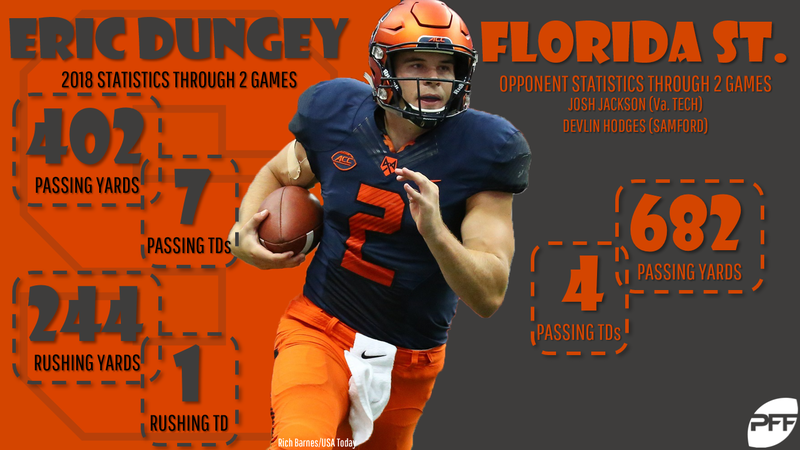 Dungey is averaging over 38 DK points per game through the first two weeks of the season. His seven passing touchdowns lead the ACC, as do his eight total touchdowns. He’s also second in the conference in rushing yards. McDonald has an insane 13:0 TD:INT ratio through three games and has also scored twice on the ground. He’s yet to fail to throw for 300 yards in a game so far and should get much resistance from the 217th-ranked passing defense (Army) on Saturday. His worst DK output this season is 38.1 points.